With so many options from which to choose, picking the right dog breed for you and your family can be a challenge. Even once you've narrowed down the size and personality traits for which you're looking, many breeds are quite similar to each other or even related. Such is the case if you're debating between the merits of an American Staffordshire terrier and an American pit bull terrier. Now cousins, these two breeds were once one and the same. If you think you're considering the pros and cons of an Amstaff vs. a pit bull, you're barking up the wrong tree. The term pit bull is a generic one used to refer to many different breeds, including the American pit bull terrier, the American Staffordshire terrier, and the Staffordshire bull terrier. Once upon a time, the American pit bull terrier was the only one of these three breeds in existence. People living in nineteenth-century England used dogs to help protect themselves when hunting wild boar and other dangerous game. In their quest for a strong protector and companion, these people bred English bulldogs with terriers, hoping to create a dog with the tenacity of a terrier backed up with the strength of the bulldog. They got what they were looking for and more, producing a dog that was loyal, protective, and strong but still gentle enough to serve as a family pet. People found many uses for the American pit bull terrier breed, but not all of them were good. Unfortunately, these strong and stocky dogs became a favorite among dog fighters. Once legal, this bloody sport involved pitting two dogs against each other in a fight to the death. Unscrupulous breeders taught their dogs to be aggressive toward other animals and bred this trait into their dogs to produce fighting champions. Even though dog fighting was eventually outlawed, many people still use the breed for illegal fighting today and sometimes use them as guard dogs. When raised in loving homes, the American pit bull terrier is a sweet and gentle breed. Their reputation as vicious fighters, however, proved impossible to shake. In order to save this magnificent breed and distance themselves from bad press, breeders and kennel clubs made some changes. Breeding programs changed focus, diligently breeding out ill-tempered dogs and refusing to breed dogs previously trained to fight or display aggressive behaviors. They also began calling their dogs American Staffordshire terriers, dropping the now-offensive name of pit bull. Soon after, the new breed was lovingly dubbed the Staffy pit bull by affectionate owners, somewhat missing the point of the breed's new name. Considered two distinct breeds today, there are some subtle differences between the American pit bull terrier and the American Staffordshire terrier. The Staffordshire is slightly shorter than the pit, reaching shoulder heights of around 19 inches high. Their American pit bull cousins, however, are slightly taller at 21 inches. Both weigh in at around 60 pounds, but it's common for the Staffordshire to weigh a bit more than a pit bull terrier. Breeders of the American Staffordshire terrier have focused more on the breed's bulldog ancestry than its terrier side, making the Staffordshire a bit more stocky and square than her American pit bull cousin. If you have trouble telling the difference, though, you're not alone. Even professionals who work with dogs every day struggle to tell these two breeds apart. You may also notice a slight difference when training the two breeds. Both are intelligent and capable of learning quickly, but the pit bull terrier is a bit more eager to please. 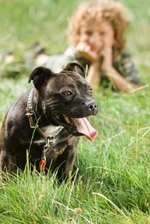 Staffordshire terriers have a bit more of a stubborn streak and could make you work a little harder during training. Both the American pit bull terrier and the American Staffordshire terrier come from the same place and the same ancestors. As such, the two breeds are far more alike than different. Both breeds are great with children and make loyal, affectionate, and loving family dogs. Both also love talking to their people and make a wide array of interesting and sometimes comical noises. Not for couch potatoes, both breeds are athletic and need plenty of exercise. Be aware that chewing and digging habits are deeply ingrained in both of these dogs. You can certainly provide appropriate outlets for these behaviors, but don't expect to curb them altogether. American pit bull terriers and American Staffordshire terriers both get very attached to their family and don't do well when left alone for long stretches of time, especially if they get bored. Boredom often means destruction, so give these smart pooches plenty to keep them busy while you're away. While neither breed will go looking for a fight, be aware that they aren't likely to back down from one. Socialize American pit bull terriers and American Staffordshire terriers early and often to thwart any standoffish behavior toward other animals.